Announcing the new Chair of the CrystEngComm Editorial Board: Pierangelo Metrangolo! We are excited to announce that Pierangelo Metrangolo (Politecnico di Milano) has been appointed as the new Chair of the CrystEngComm Editorial Board! Pierangelo Metrangolo has been a full professor at Politecnico di Milano since 2011 and a Visiting Professor at VTT Technical Research Centre of Finland since 2011 and Aalto University, Finland, since 2015. He has published over 200 peer-reviewed studies, contributed 9 book chapters, and holds 11 patents. He has been awarded the “G. Ciamician” medal of the Division of Organic Chemistry of the Italian Chemical Society (2005) and the Journals Grant Award of the Royal Society of Chemistry (2005). 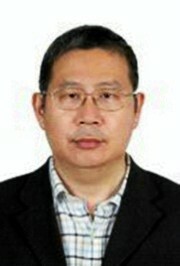 His research interests include supramolecular chemistry, halogen bonding, fluorine chemistry, and bio-nanomaterials. He is currently a Titular Member of the Physical and Biophysical Chemistry Division of the IUPAC and Since 2013 he has been the holder of an European Research Council grant for the project “FOLDHALO – Folding with Halogen Bonding”. Pierangelo has been an Editorial Board member of CrystEngComm since 2013 and we’re delighted he has agreed to become our new Chair! He takes over from Professor Leonard MacGillivray, who has led the journal since 2011 and will continue with the journal as an Advisory Board member. We would like to thank Professor MacGillivray for his work on the journal and welcome Pierangelo as our new Chair! Here are some of Pierangelo’s choices of great articles and reviews that CrystEngComm has published recently and his thoughts on the impact that they are having on the community. All articles listed here are free to read for a limited time. Anion-exchange in CsPbBr3 nanocrystals using zinc halogenide salts could spread their emission spectra covering the whole visible spectral region. Co-crystallisation of helically chiral porous organic cage molecules has enabled the formation of isoreticular quasiracemates and a rare porous organic ternary co-crystal. Here we illustrate how to easily produce 3D printable model files from any standard structural model using the freely available visualisation program Mercury. 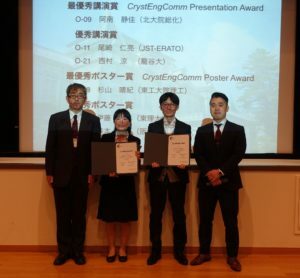 Top Crystal Engineering articles of 2017! This original research is off to a great start, as some of our most cited work these papers and communications are already receiving recognition from the crystal engineering community. Seven new mixed-ligand complexes based on 3,6-bis(imidazol-1-yl)pyridazine and various auxiliary ligands were synthesized and all complexes present good catalytic performance for the homocoupling reaction of 4-substituted aryl iodides bearing electron-donating groups. The potential of N-benzyl-4-amino-1,2,4-triazole-related ligands as new candidate for aqueous/seawater sulfate separation was demonstrated. Sulfate anions were crystallized in form of [HSO4−·H2O]n or [SO42−·H2O]n sulfate–water clusters both selectively and effectively. Iodine⋯pi halogen bonding is crucial to the self-assembly of brominated and iodinated Fmoc-phenylalanines. 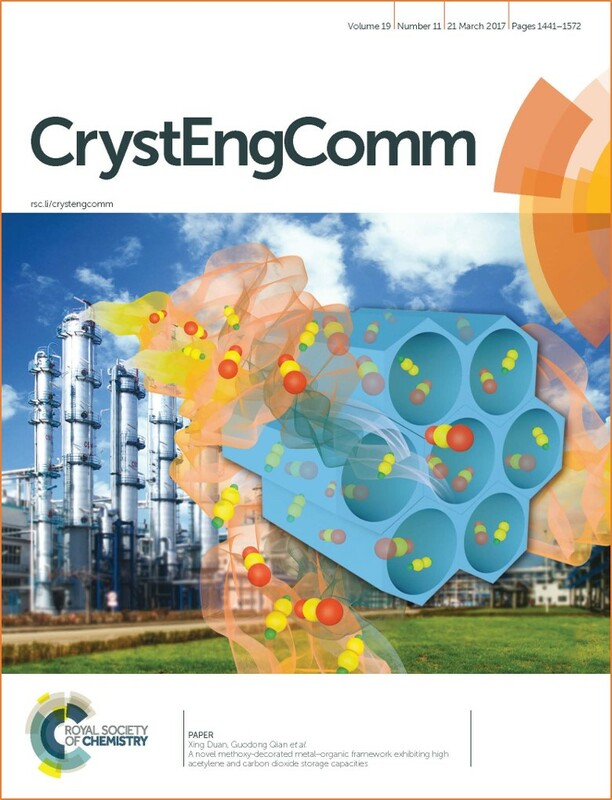 Submit your research or reviews on crystal engineering, crystal growth, and supramolecular chemistry to CrystEngComm – see our author guidelines for information on our article types or find out more about the advantages of publishing in a Royal Society of Chemistry journal. Most cited Coordination Network papers of 2017! Coordination Polymers and Metal-Organic Frameworks are among the most promising crystalline materials for a variety of applications, from gas storage to the detection of hazardous materials. The design, engineering and growth of these materials are pressing challenges, and papers tackling these hurdles are among our most impactful of 2017. 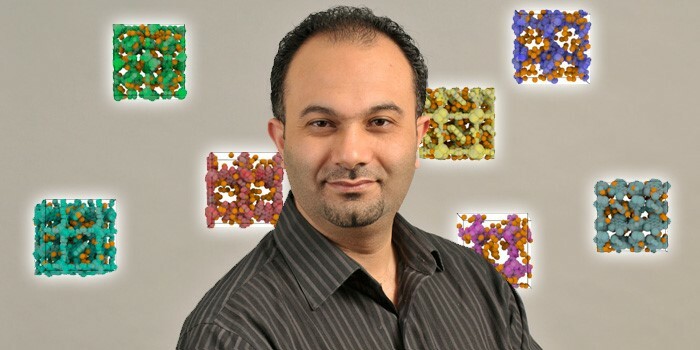 This original research is off to a great start, as some of our most cited work these papers and communications are already receiving recognition from the coordination polymer community. A layered zinc-diphosphonate templated by protonated 2,4,6-tri(4-pyridyl)-1,3,5-triazine was hydrothermally fabricated. The title compound displays rapid photochromism upon irradiation with UV light or sunlight at ambient temperature. The contamination of water with fluoride (F−) is a source of mounting concern for global public health, and the removal of fluoride is quite important and challenging. The coordination self-assembly of a photoactive viologen ligand in the presence of a strong electron-donating oxalate anion has successfully afforded a photochromic coordination polymer with high sensitivity not only to ultraviolet-visible radiation but also to X-rays. Submit your research or reviews on coordination polymers and MOFs to CrystEngComm – see our author guidelines for information on our article types or find out more about the advantages of publishing in a Royal Society of Chemistry journal. 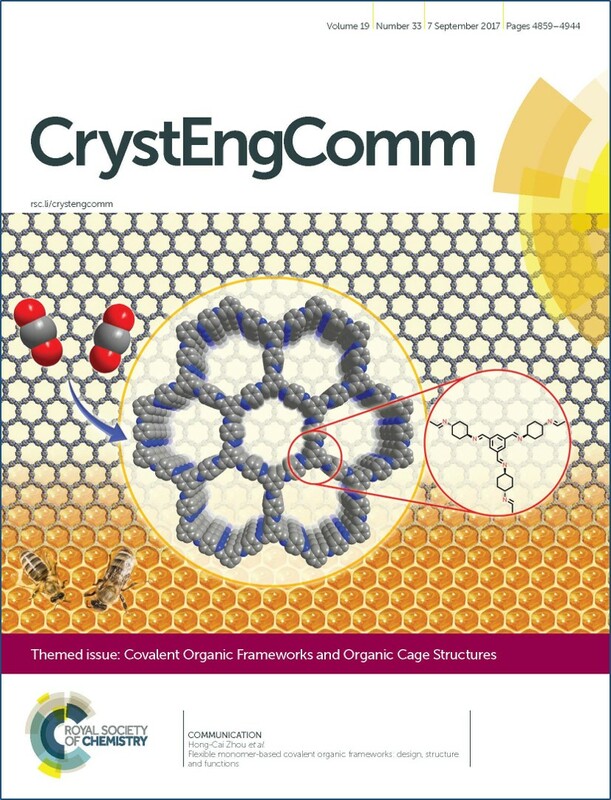 Check out our COFs and Organic Cage Structures Themed Issue! 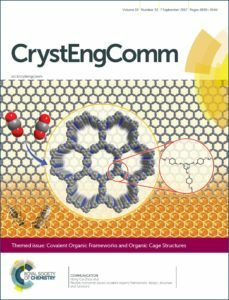 Earlier this year we published a Themed Issue focusing on the design strategies for the construction of porous organic materials, including covalent organic frameworks (COFs) and organic cage structures. Featuring contributions from some of the leaders in this captivating field and guest edited by Rahul Banerjee and Neil R. Champness. See their editorial, check out the full contents, or read on for some of our selections of great articles from this issue. In this work by Zhou et al. the first example of a COF based on flexible monomers is reported. The material was synthesised by carrying out a Schiff base condensation between a rigid, aromatic carbonyl and a flexible amine. The resulting structure was found to be highly crystalline and porous, with a honeycomb-like hexagonal array of 1D channels (as seen in the cover art). The gas adsorption properties were studied and the material was found to demonstrate promising carbon capture capabilities. The interactions between porphyrins and fullerenes is interesting not just from a supramolecular point of view, but also due to the potential photochemical and conducting properties demonstrated by these pairs. In this work by Frontera et al. bis-porphyrin macrocycles are connected into 1D chains using extremely bulky perylene linkers. The size of the linker prevents it from acting as a guest in the porphyrin cage – leaving this site vacant to bind fullerenes as guest molecules. The authors found that occupancy of these cages was 100 % and went on to use computational methods to study the host-guest interactions present in these systems. A problem that has plagued the development of 2D COFs is that they generally exhibit low crystallinity, hindering characterisation. In this work by Hisaki et al. a series of X-shaped building blocks are linked by hydrogen-bonds to form 2D rhombic networks. These sheets stack without interpenetration to form low density frameworks. The aromatic cores of the monomers influence the stacking of these sheets, in two cases resulting in 1D inclusion channels. This in-depth structural analysis of these materials could enhance our understanding of the structures, stacking, and interlayer interactions of 2D COFs. In this paper by Cooper et al porous materials are formed by coupling the synthesis of porous organic cages (POCs) with a crystal engineering approach, relying on the intermolecular interactions between cages to direct their co-crystallisation. Rather than rely on the strong, directional intermolecular interactions that are typically used to design co-crystals, but which are often incompatible with cage synthesis, the authors relied on chiral recognition between opposite handed pairs. Combining a chirally pure POC with a helical racemate forms new, quasiracemates in which the POCs stack window-to-window to form diamondoid pores. 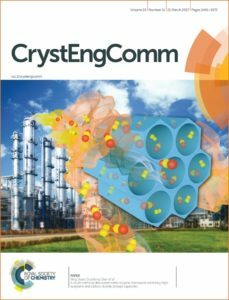 Submit your research on porous organic materials to CrystEngComm – see our author guidelines for information on our article types.